Here’s another pecan pie, and since I have so many I’m naming it as such! 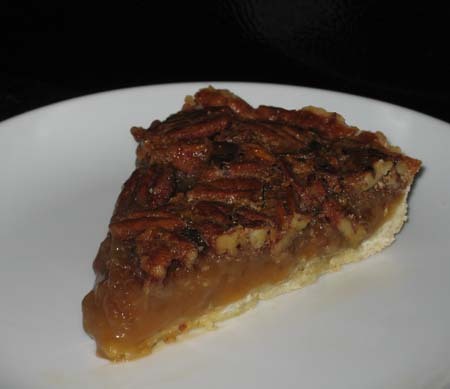 This is a traditional pecan pie with a filling that is very soft, but sets up well. It is a sweet pie, so if you prefer less sweet pies, you might want to consider a different recipe. Still, it’s not cloyingly sweet and one friend said it was the best pecan pie he’d ever tasted. 3) cooked the syrups and sugar before using. If you want to take it one step further, bake the pecan pie a day ahead, let it cool completely, then freeze it and thaw it. For some reason, pecan pie smooths out after being frozen. If you don’t freeze this one, it’s still excellent. I used a crust recipe from Baking in America. I didn’t fashion a rim for the pie, which is why this one looks kind of strange. The crust was terrific, though. At some point, I’ll post that recipe too. In this recipe the sugar an corn syrups are boiled together before being mixed with the eggs and other ingredients. Preheat the oven to 350 degrees F. Lay the pecans flat on a cookie sheet and toast them for 8-10 minutes. Let them cool, then chop them. Meanwhile, in a small to medium size saucepan, boil sugar and both corn syrups together for 2 to 3 minutes; set aside to cool for 20 minutes. In a mixing bowl beat eggs lightly with a spoon and slowly pour the syrup mixture into the eggs, stirring constantly. Stir in the cooled browned butter, vanilla, and toasted pecans; pour into crust. Set pie plate on a cookie sheet and bake for 40 minutes. When you take the pie out of the oven, it will still be quite jiggly. Let it cool for a few hours and don't be tempted to cut into it. It will set as it cools. Notes: To brown butter, heat butter in a small saucepan over medium. Keep a close eye on it and just when you see brown on the edges, remove from heat and swirl to stir up the browned bits. Now that I know what you like, I recommend the second pie on this link. It has a lot of browned butter to offset the sweetness of the syrup and nobody has ever told me it was too sweet. The one on this post is good, but I’ve made so many pecan pies since then I’ve realized that my favorite is the one on the link above. Hi Aaron, I don’t remember. It’s possible I chilled it because I usually chill or freeze my pecan pies before thawing and cutting. That piece looks like it was frozen and thawed. Sometimes freezing and thawing the pie smooths out the texture. Did you put the pie in the picture in the freezer? I think the next time I make pecan pie bars, I will add Bourbon and chocolate chips. I lost my pie crust bible by Rose Levy Beranbaum in the flood, but I’ll have to try this recipe next. My boss made some pecan pie bars from a Southern Living cookbook and they were so freaking good!! I think pecan pie is my absolute favorite. Maybe coconut cream. I will have to try freezing the pie. I think that’s cool that the filling smooths out. Do you have any Derby Pie recipes? Also, I just realized that I must have started reading your blog after the major heat waves of DC were over, because I’m having a hard time reconciling running the AC while baking.